(Nanowerk Spotlight) Catalysis is one of the most important routines for the production of nanomaterials. The catalysts that are used in these processes play a vital role for the controllable fabrication of nanomaterials with anticipated structures. For instance, carbon nanotubes are generally grown on metal catalysts. Single-walled carbon nanotubes (SWCNTs) are expected to be a preferred material for electrodes in high-performance Li-ion batteries and supercapacitors due to their high specific surface area and good structural stability. However, the CNTs grown through routine catalytic chemical vapor deposition (CVD) have always shown non-carbon impurities ([email protected]). These impurities play a significant role in the decay of the stability of SWCNT electrode materials due to the high reactivity of metal nanoparticles. This has hindered the full demonstration of the extraordinary intrinsic properties of carbon nanotubes. 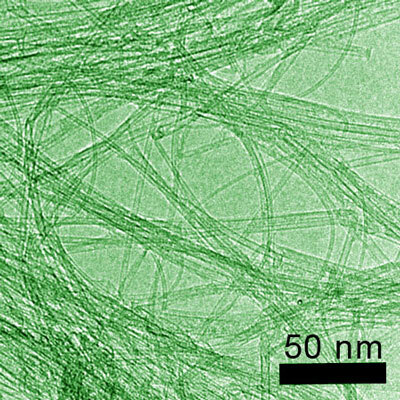 Effective purification of SWCNTs has therefore attracted significant attention from researchers around the world in order to improve the performance of carbon nanotubes, especially in energy storage systems. Researchers from Tsinghua University in Beijing, led by professors Qiang Zhang and Fei Wei, have now conducted an in situ study of the CVD growth and CO2 oxidation of SWCNTs which provides real-time information on the working catalyst during reaction and the reactivity information of [email protected] nanoparticles and SWCNTs under an oxidizing atmosphere. The team has published their findings in a recent issue of Advanced Functional Materials ("In Situ Monitoring the Role of Working Metal Catalyst Nanoparticles for Ultrahigh Purity Single-Walled Carbon Nanotubes"). "The catalysts and products before and after reaction/purification have been widely characterized, but the role of working catalysts during CNT growth and purification has rarely been monitored," Qiang Zhang tells Nanowerk. "We employed a thermogravimetric reactor to probe the growth and CO2 oxidation of SWCNTs. The mass of the working catalysts can be recorded by the microbalance; the heat changes of the working catalysts can be monitored by the differential thermal analyzer; and the carbon source conversion on the working catalysts can be detected by an attached mass spectrometer." In their experiments, the researchers demonstrated that the growth of SWCNTs and [email protected] nanoparticles can be distinguished by controlling the growth duration. "The SWCNTs grow rapidly, but they stop growth after the initial 2 minutes; the [email protected] shells grow slowly, but they can be continuously formed for a long duration," says Zhang. "We found that by reducing the growth duration from 30 to 2 minutes, the purity of the as-purified large-scale produced SWCNTs can be improved from 90.4 to 98.5%." Furthermore, results of the in situ thermogravimetric study of the CO2 oxidation of SWCNTs revealed that the selective oxidation of the graphene layers surrounding the metal nanoparticles without obvious destructing the SWCNTs can be achieved, leading to the effective removal of the metal nanoparticles through the following acid treatment. Consequently, the team carried out a CO2-assistant purification process on the as-purified SWCNT to improve their purity from 90.4 to 99.5%. "In contrast to commonly reported CVD growth and purification, we were able to achieve high selective growth and efficient purification of SWCNTs with few [email protected] nanoparticles under the guidance of the in situ characterization," notes Fei Wei. "In situ monitoring of the working catalysts is extremely important for good results. The resulting process parameters will be instrumental in designing a viable route for mass production of carbon nanotubes with high purity." In addition to producing carbon nanotubes, such a CVD thermogravimetric reactor offers opportunities for characterizing the dynamic of CNT formation with high-precision time-resolved mass, which is crucial for probing dynamic changes on catalytically active species and understanding reaction pathways. As Zhang and Wei point out, this approach may also be applicable to systems using other catalytic reaction with product deposition on the working catalyst. Going forward, the researchers hope to probe dynamic changes on catalytically active species and understand reaction pathways on the working catalysts with high time- and space-resolution.